It is a novel idea, but not very practical. It is also not a study Bible. 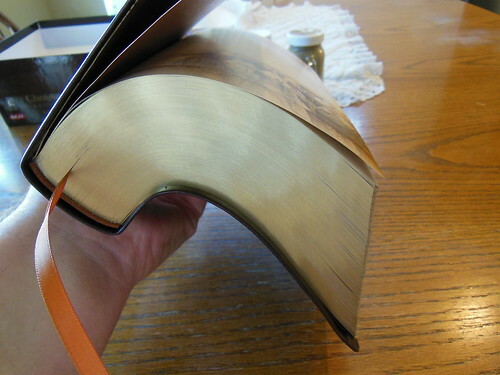 It is more of a reference Bible with added notes. 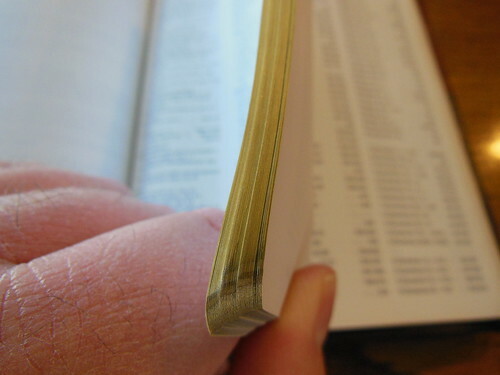 If you want to look up a verse you have to go to the verse index in the back, find the verse you are looking for, then go to the page indicated by the index. 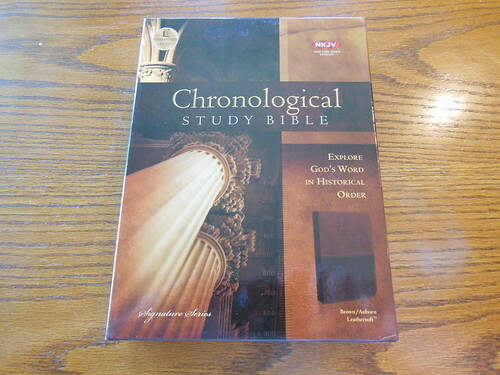 I know that if you have purchased this Bible it is probably for the chronological arrangement, but the trouble of finding your way in this is not worth the trouble in my opinion. There is a good reason for having the Bible arranged in books instead of epochs. They could have scrapped the book, chapter, and verse, format altogether and went solely with the epoch arrangement. This would have required the user to learn the location of verses within their historical location, but would have negated the need for an awkward index system utilized by this hybrid arrangement. Of course they wouldn’t be able to reach as many customers that way. The best option, in my opinion is to stick with the book, chapter, and verse arrangement, and use book introductions with the appropriate notes. The typical commentary notes you’d expect from a study Bible are missing. 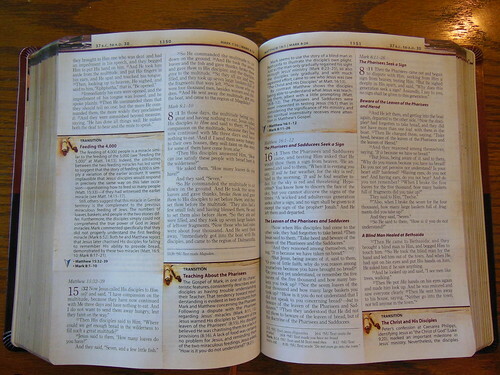 Instead there are features, or small articles interspersed throughout the Bible. Many of these are not Reformed, or complementarian friendly. They also seem to employ a cultural hermeneutic to many scripture passages instead of the proper hermeneutic for the particular passage. It is obvious that this Bible’s articles are focused on appealing to the modern cultural sensitivities in hopes of selling more Bibles. If you are a Methodist, Nazarene, Arminian Baptist, or any other non-Calvinistic confessor you will like the notes. The heading for Romans 8 says that it is about the rejection of the gospel by Israel. From that heading it is meant that Romans 8 is about a national election not an individual one. Which is quite odd considering how most of the converts of the early Church were Israelites. The gospel came to them first and then the gentiles. In Ephesians 5 there is an article imposing a cultural hermeneutic on the passage instead of making it prescriptive it is implied that this was just for that culture. The same thing is done with 1 Timothy 2. 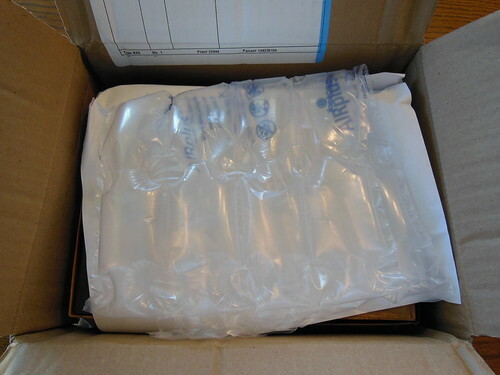 The Bible was shipped in a cardboard box with air bladder packing material. The Bible arrived undamaged. It has a two piece retail box. The synthetic cover has perimeter stitching. The stitching would have been a nice feature if the inside liner were not paper. The cover is pretty flexible. 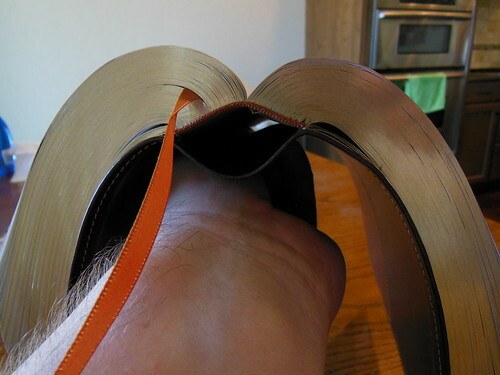 That in conjunction with the sewn binding makes the entire Bible flexible. There is a single ribbon marker, along with gold gilt page edges. The text is in a double column format with full color features interspersed throughout. The 9 pt. font is legible and uniformly printed. 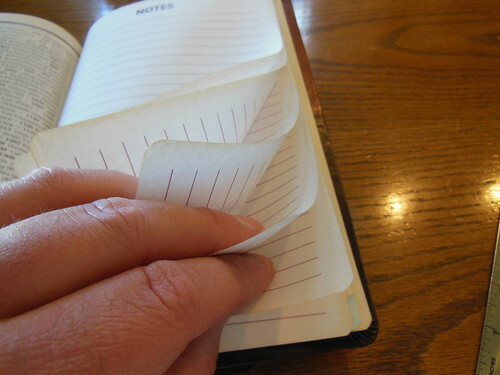 There is a substantial concordance in the back and some ruled paper for notes. This Bible is advertised as a study Bible, but it is definitely not. It forgoes them for biased articles. 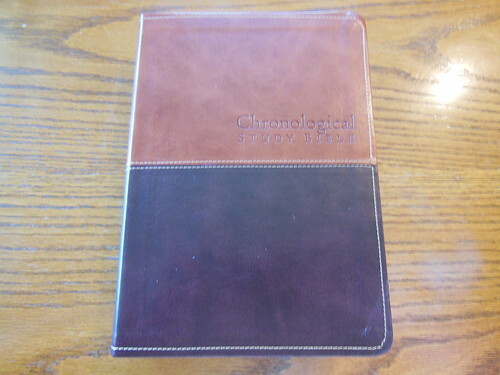 If this were just a NKJV Bible I would recommend it, but due to the bias in the articles, and notes I cannot. I would definitely not purchase this Bible unless I was not a Calvinist. I found it insulting to be honest. If you’d like to purchase this Bible you can get a copy here. 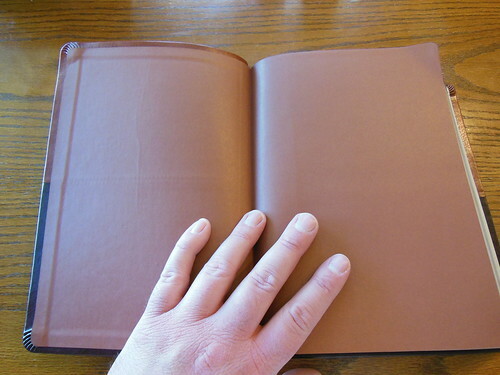 Make sure to look at all the pictures I took of this Bible on the Flickr album page. Review of the Trinitarian Bible Society’s (T.B.S.) Hebrew/Greek Bible. Thank you for the wise warning!! !